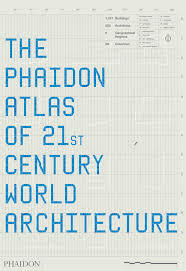 The Phaidon Atlas of 21st Century World Architecture is a comprehensive portrayal of the finest built architecture from around the world completed since the year 2000. Divided into six world regions, the Phaidon Atlas of 21st Century World Architecture provides an important overview of global and local trends in architecture for a wide range of users. The geographical contexts for twenty-first century architectural production are explored in a global framework presented in accessible graphic formats. Each of the six world regions is introduced by an in-depth look at their unique urban and architectural issues. This statistical data has been researched and analyzed by a team of from the London School of Economics. More than 1000 key buildings have been chosen through a rigorous selection process involving a panel of expert advisors and specialists from every region. Each building is fully illustrated with drawings and photographs, and each is described by a short essay. Further information includes key data such as construction cost, client name, area of the building, and geographical coordinates. Cross-referencing between projects helps the user to find other buildings by the same architect included in the book. In addition, a mass of useful information is provided, including details about the architects’ practices, as well as extensive indices.